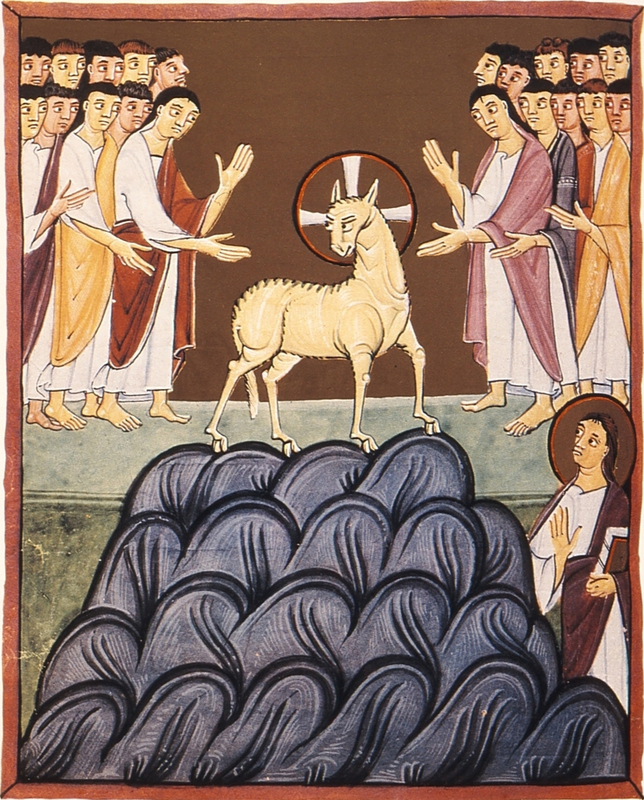 Folio 34, The Lamb on Mt. Sion, the Bamberg Apocalypse, 11th C., Bamberg State Library, Bamberg, Germany. The chapter marks the first indication of redemption following the rampages of various beasts. I explain the numerology of 144 “thousand” and one thousand six hundred furlongs, the Old Testament precedent for the marking of foreheads and many other Old and New Testament allusions, including “fear of the Lord” and wine/winepress of the wrath of God. 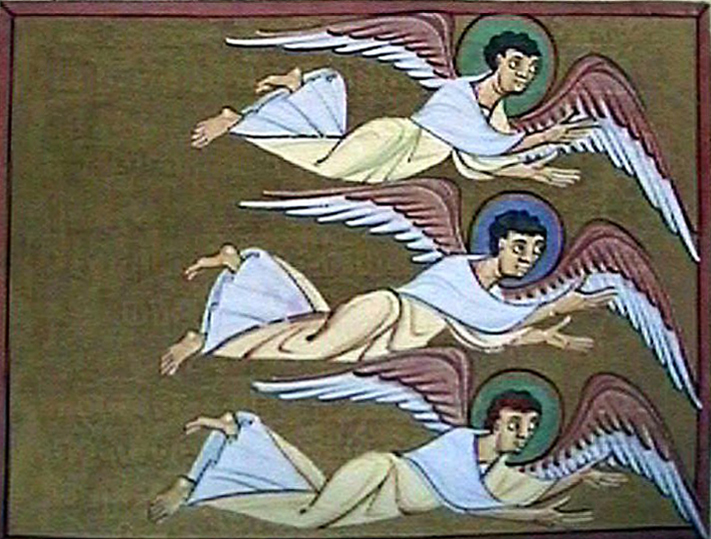 Folio 35, Three Angels Flying, Bamberg Apocalypse, Bamberg State Library, Bamberg, Germany. 11th C.
The chapter also marks the return of 4 Living Creatures and the 24 Elders, unseen and unheard-from since Revelation 11, and the introduction of another beatitude: “Blessed are the dead who die in the Lord from now on” (Revelation 14:13). This is the 2nd of seven beatitudes in Revelation. It gave me a chance to discuss three possible meanings of “rest” from both the Old and New Testament traditions. The chapter also includes the reappearance, the first since Revelation 1:13b, of “One like the Son of Man, which provided the opportunity to discuss the Old Testament concept of outside the city, or outside the walls. Episode Twenty-one (Chapters 15 and 16) and Episode Twenty-two (Chapter 17) are complete except for the recording of the sound track. These two episodes will be uploaded, one each week, in September. Thanks to all of you who have viewed and/or shared these free Bible Study videos. I’m looking forward to completing the series by early October so that I can get started on transforming them into an illustration book manuscript to be offered through my Amazon Author central site.